FORT MYERS, Fla., April 3, 2019 /PRNewswire/ -- Chico's FAS, Inc. (NYSE: CHS) and its family of brands, Chico's®, White House Black Market® and Soma®, announce their 2019 Spring campaign, partnering with Habitat for Humanity International to bring awareness to the issue of affordable homeownership for women and their families. According to Habitat, nearly 19 million U.S. households spend more than half of their paychecks on housing costs, creating a burden that often requires families to make difficult choices between their housing, healthcare, education and transportation. This year the multi-faceted Spring campaign will support Habitat for Humanity's Home is the Key campaign and the national Women Build program, impacting communities across the nation. The partnership is aimed at empowering women to build strength, stability and independence through housing. "At Chico's FAS we believe in empowering women to reach their greatest potential. For most people, it's a high achievement to own your home. Last year, more than half the homes purchased through Habitat for Humanity were by women led households. Home ownership provides transformational change to a woman and her family, and helps to empower her, which in turn, positively impacts her family and the community for generations," says Lori Shaffer, Senior Vice President of Outlets for Chico's FAS, Inc. and Chair of the Company's Corporate Giving Board. "At Chico's FAS we want to help more women turn the key that unlocks opportunity." The campaign spans the months of April and May, with opportunities that engage Chico's FAS Associates as volunteers and enables customers to contribute through donation or by purchasing select items that give back. The sponsorship includes support of Habitat's 2019 Women Build program, which recruits, educates and inspires women to build and advocate for safe and affordable shelter in their communities. Chico's FAS will directly impact multiple communities across the United States, including the complete funding of two new homes and providing $5,000 grants to 15 Women Build projects. To further the effort, each of Chico's FAS' brands will donate a portion of select product sales, up to a combined maximum donation of $600,000, to benefit Habitat for Humanity. 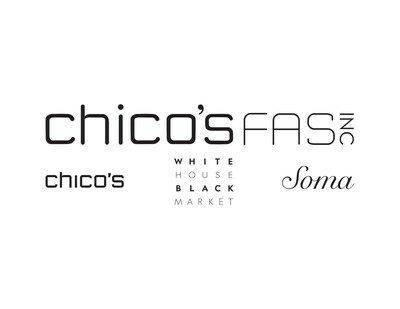 Additionally, Chico's FAS will collect register donations at its Chico's®, White House Black Market® and Soma® boutiques, outlets, and online at www.chicosfas-cares.com. "Chico's FAS recognizes that affordable housing is the cornerstone to vibrant communities and a strong economy," said Colleen Finn Ridenhour, Senior Vice President of Development, Habitat for Humanity International. "We thank Chico's, White House Black Market, Soma and their employees for their continued commitment to a world where everyone has a decent place to call home." Chico's FAS will also sponsor Habitat's third annual Home is the Key campaign, which gathers sponsors, celebrities and community leaders to speak out on the importance of affordable housing throughout the month of April. Chico's FAS helped kick-off the 2019 campaign in Atlanta, Georgia last week where volunteers helped construct an affordable home alongside future homeowner Krushetta and her sons. The home will be completed over the course of April.